For quick answers to our most frequently asked questions please see our F.A.Q. For the safety of our guests and the continued enjoyment of our vacation properties we do have a few rules and regulations. Kelleys Island Chamber of Commerce – Your complete Kelleys Island, Ohio information source for ferry boats, golf carts, boating and more. Lake Erie Shores & Islands – The official travel guide for Erie & Ottawa counties. Cedar Point – The roller coaster capitol of the world! Cedar Point is a 365-acre amusement park located on a Lake Erie peninsula. Sandusky, Oh. Soak City – An 18-acre outdoor waterpark located on a Lake Erie beach next to Cedar Point. Soak City features Dragster H2O, a towering multi-lane mat racer. It also offers Splash Zone, a huge bucket and multi-story interactive water play area with tipping bucket, a half-million-gallon wave pool, Zoom Flume raft ride, tube slides, a wild inner tube river, and a relaxing, meandering river. Choo-Choo Lagoon and Tadpole Town offer fun for little ones. Sandusky, Oh. Balloon Rides Over Ohio – Ascending in a hot air balloon and cruising over the picturesque landscape of Ohio is indeed the thrill of a lifetime. Ohio Hot Air Balloons has beautiful hot air balloons with experienced pilots serving Huron, OH that are ready to share the experience with you right now! Huron, Oh. Merry Go Round Museum – Enjoy a fun and relaxed atmosphere while you tour the Merry-Go-Round Museum and learn about the history and art of the carousel. Sandusky, Oh. Maritime Museum – Dive into the Maritime Museum of Sandusky, where you’ll have a boatload of fun discovering the rich maritime history of the Sandusky Bay area. Sandusky, Oh. Monsoon Lagoon Water Park – Water slides, mini golf, go-carts, concessions, arcade and more. Port Clinton, Oh. African Safari Wildlife Park – African Safari Wildlife Park is the Midwest’s only drive-thru safari. Home to giraffe, zebra, and so much more! Get ready for a wild time feeding exotic animals from your vehicle. Port Clinton, Oh. Firelands Winery – A tour of Firelands winery will give you an opportunity to see first hand how our wine is made. Your unique vantage point from our tour balcony will give you a clear view of the cellars, bottling room, champagne cellars, and warehouse. You will be able to see and experience an authentic working winery, taste our products, and browse our wine boutique and gift shop. Sandusky, Oh. Perry’s Cave – Perry’s Cave, registered as an Ohio Natural Landmark, is a natural limestone cave steeped in historical tradition. Don’t forget to visit the butterfly house, antique car museum, and do some gemstone mining while you’re there. Put-in-Bay, Oh. Ghostly Manor – Come to Ghostly Manor Thrill Center for some crazy fun family time! We have 7 attractions so there is no way your child will want to pick up their iPad! Sandusky, Oh. Goofy Golf – Go carts, mini golf, bumper boats, arcade. Sandusky, Oh. Island Adventures – Island Adventures Family Fun Center is one of the most frequented family entertainment centers in Vacationland! Bumper boats, go-carts, arcade, mini golf, mining. Port Clinton, Oh. Thunderbird Hills Golf Course – Thunderbird Hills is a family owned 36-hole golf facility located on the beautiful banks of the Huron River. Huron, Oh. Heineman’s Winery – For over 100 years, producing some of Ohio’s finest wines. Tour the winery and Crystal Cave. Wines and grape juice tastings in our beautiful wine garden. Put-in-bay, Oh. Lagoon Deer Park – As you stroll through the park you will be greeted by animals of all nations. You’ll feed them by hand, and they will follow you through the park. Sandusky, Oh. Lakeside Chautaugua – An historic community in Ohio that offers an abundance of spiritual opportunities, educational lectures, cultural arts performances and recreational activities during its 10-week summer programming season. Lakeside, Oh. Moyer Rideing Stable & Farm – Take a peaceful, scenic, guided horseback ride on a trail along the river, through the woods, and around the ponds. Oak Harbor, Oh. North Coast Parasail & Water Sports – Experience the thrills of WaveRunner rentals and parasailing high above Lake Erie on the Cedar Point Beach. Also offering private boat charters on a well-equipped 31 ft. boat that holds up to six. Sandusky, Oh. Paratus Air Helicopter Tours – Helicopter tours over Put-in-Bay, Port Clinton, and Sandusky starting at $20 per person from Port Clinton, and $49.99 from Put-in-Bay Airport. Port Clinton, Oh. Put-in-Bay, Oh. Safari Outdoor Adventure Water Park – Safari Outdoor Adventure Park features a thrilling zip line course, ropes course, climbing walls, and much more. Day passes available, no stay required. Sandusky, Oh. Sawmill Creek Golf Club – Sawmill Creek Golf Club is located at Sawmill Creek Resort. This Tom Fazio-designed, 18-hole, par 71, public course offers views of Lake Erie. You will enjoy this challenging course. Huron, Oh. Sawmill Creek Watercraft Rentals – With Sawmill Creek Watercraft Rentals, you can rent a Jet Ski, stand-up paddle board, or kayak and enjoy the open waters of Lake Erie while viewing some of the most beautiful coastline, beaches, parks, and wildlife. Huron, Oh. Tree Tops Zip Lining at Sawmill Creek – Explore the Vermilion River Valley on seven zip lines, 87 ft. above the water. It’s a rush through the tree tops with 30 acres of certified zip lines. Quiet sounds, safe flight, and scenic views to remember. Guides take you along for a really fun adventure. Huron, Oh. Kelleys Island Historical Association – Visit the museum to learn more about Kelleys Island, its history, and its people. Kelleys Island, Oh. Marblehead Lighthouse – Built in 1821, the Marblehead Lighthouse is still standing strong as the oldest lighthouse in continuous operation on all of the Great Lakes. Gracefully set on the rocky limestone shore of Lake Erie, this beacon and its adjacent Keeper’s House became an Ohio State Park in 1998. Lakeside-Marblehead, Oh. Perry’s Monument – Perry’s Victory and International Peace Memorial was established to honor those who fought in the Battle of Lake Erie, during the War of 1812, and to celebrate the long-lasting peace among Britain, Canada and the U.S. The Memorial, a Doric column, rising 352 feet over Lake Erie is situated 5 miles from the longest undefended border in the world. Put-in-Bay, Oh. Lonz Winery – The land has been purchased by the state of Ohio, with the intention that it will eventually become a state park site, preserving a piece of Ohio’s history on picturesque Middle Bass Island. Middle Bass, Oh. Thomas Edison Birthplace Museum – The Edison Birthplace Museum features a collection of rare Edisonia, including examples of many of Edison’s early inventions, documents, and family mementos. Milan, Oh. Johnson’s Island Confederate Officers Prison Cemetery – The creation and administration of the Depot of Prisoners Of War, Johnson’s Island, Sandusky Bay, Ohio, is perhaps the most historically interesting part of the island’s colorful history. During the 40 months of its existence, approximately 10,000 men were processed into the stockade on Johnson’s Island. Most were Confederate officers. Sandusky Bay, Oh. South Bass Island Lighthouse – Visitors have the opportunity to tour the historic lighthouse and grounds. Put-in-Bay, Oh. Kelleys Island State Park – The 677-acre state park with sandy beach is located on the northern shores of Kelleys Island. Kelleys Island, Oh. East Harbor State Park – Located on the shores of Lake Erie in Marblehead, Oh., East Harbor State Park has unlimited opportunities for outdoor recreation; boating, fishing, swimming, picnicking, and wildlife. Lakeside-Marblehead, Oh. Erie Metro Parks – A selection of parks with activities that include hiking, swimming, fishing, wildlife watching, and more. Erie County, Oh. 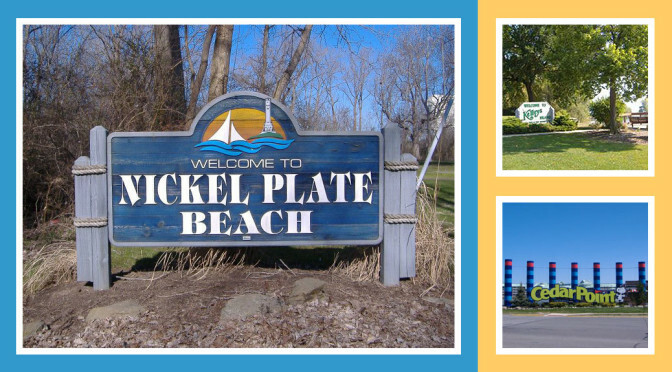 Nickel Plate Beach – This lakefront stretch of sandy beach features picnic facilities, volleyball courts & a playground. Huron, Oh. Huron Boat Basin & Amphitheater – Live music and entertainment spring through fall. Great for family entertainment, the Amphitheater at the Huron Boat Basin presents a free, family-friendly movie series that runs from mid-July to mid-August. Huron,Oh. Kelleys Island Ferry – Kelleys Island Ferry offers the only daily auto/passenger ferry service to Kelleys Island with a short enjoyable 20 minute boat ride from Marblehead, Ohio. Jet Express – Passenger ferry service between Kellys Island and Sandusky, and between Port Clinton and Put-in-Bay. Sandusky, Port Clinton, The Lake Erie Islands. Miller Ferry – Ferry service to Middle Bass Island from Catawba Island. Port Clinton, Oh. Vermilion River Scenic Cruises on the Mystic Belle – Take a relaxing paddle-wheel tour on the historic and scenic Vermilion River. The tour showcases the beauty of both the natural upriver scenes as well as the picturesque lagoons, and includes narration about the harbor’s past. Vermilion, Oh. Caddy Shack Square – Kellys Island bike and golf cart rentals. Kelley’s Island, Oh. Kelleys Island Kayak Rentals – Located in the Kelley’s Island State Park on the public beach. Kelleys Island, Oh. West River Paddle Sports – Guests are welcome to be captain of your own watercraft. ACA certified staff offers hourly, daily, and overnight rentals, lessons, and excursions. Enjoy the historic and beautiful scenery along Lake Erie and the Vermilion Water Trail. Vermilion, Oh.